The Bank of Waynesboro has delivered the best in banking services to Wayne County and surrounding areas since its inception in 1904. This community bank maintains 4 locations in Tennessee: Waynesboro, Barlow, Collinwood and Lawrenceburg. Shoals Works was asked to come aboard and implement our Pro Plus Package to refresh their existing site. Bank directors know their clients enjoying accessing the Bank’s website from their mobile devices. Offering a responsive website to their client base was a top priority for this project. The Bank of Waynesboro is a Jack Henry & Associates, Inc. client for the delivery of their NetTeller® Online Banking™ solution. 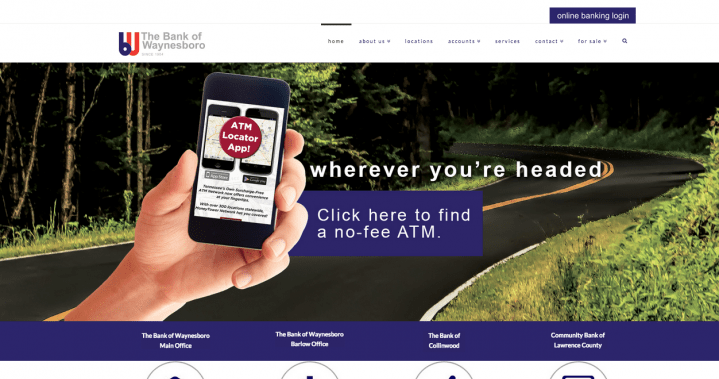 Shoals Works implemented and maintains a professional, easy to use website for The Bank of Waynesboro that their customers have enjoyed using from day one. As a direct result of this project, Shoals Works has setup a special company directive to assist other community based banks in achieving the goal of offering a modern banking website to their clients. If you are a bank director seeking a similar solution, contact us to find out how our experience from this project can make make this a reality for your bank.